Two photographers and a lawyer, nattering about their common interests. PhotoLegal is a podcast exploring legal issues that affect UK Photographers, from copyright and protection of images on the internet, to the thorny questions about photography in public places and current anti-terrorism laws. Amazing!! Have just learned from the Nokia E71 blog, that I can make a blog posting here, direct from My Nokia 71, here in the street. Simply by send this as an email. 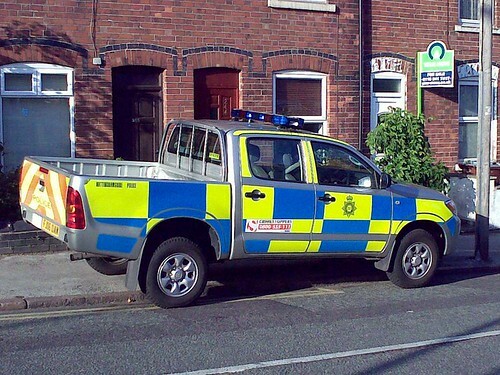 Nottinghamshire Police vehicle. What is wrong here? This is a Nottinghamshire Police vehicle, parked on double yellows, while his mate goes into Sainsbury’s. If you or I did this, and we’re spotted, then we can expect a ticket. If on an emergency call, then fair enough, but for their convenience while shopping ….. no. You might consider it petty of me, but I have made and official complaint. Like most folks, in the past, I would have just let it go, that’s the police for you. But the links below, show an increased belligerence in dealing with photographers and I have hundreds of other examples. They show that I might have been arrested in the attempt to shift blame. I might have been assaulted, my camera kit seized as ‘evidence’ with months of arguement, to get it back. So if this is the atmosphere, then I think we should all note these kind of matters and do something about it, until ‘they’ stop being so bloody awkward to us. So there!!! 1 April 2009 – Financial Fools Day: As the 29 G20 leaders gathered in London, thousands came out on to the streets of the financial district to protest a wide range of issues from climate change to the failing capitalist system and tax payers bailout of the international banking system. 10,500 police were drafted in, at an estimated cost of £10 million, to police the protests and protect the banking institutions from what the police had deemd “the summer of rage”. The end product was two policers suspended, scores injured and hospitalised and one man dead after being attacked by an unidentified member of the TSG (Territorial Support Group) riot squad. released video footage of a journalist detained within the police cordon at one of the G20 protests in London earlier this month.